For days now I’ve been itching to sit down and blog, but just haven’t had the time. It’s been crazy busy here lately! Plus, the topics pressing on my typing fingers haven’t been particularly blog-worthy. So I suppose it’s a good thing that I haven’t had time to let them out. Even now, it’s 10:30 at night and I’m having to look at the screen with my head tilted back a little so I can make out the words I’m typing. Last night wasn’t particularly kind to me in the sleep department, and I’m totally feeling it. But I finally got Brennah to go to sleep a few minutes ago, and the quiet of my house is too much for me… I must take advantage of it… if only for a few minutes! So Nathan and the current GE team left this-morning for the Zoque jungle. I know I’ve said it a hundred times before, but hey. A little repetition never hurt anyone. I am so proud to be married to him! I love how passionate he gets when he talks about the status of any given project he’s got going. I love the way he lights up when someone asks him a deep question about the Zoque or Ch’ol people. God has given Nathan some unique abilities that I think he’s doing a great job putting to use. That’s the end of my rabbit trail. Back to topic. In order to better survive these times of being single mom for a few days, I try to give myself lots of projects. This is never difficult as my house almost always looks like a bomb went off. Or at least like a few toddlers tore through it. Either way, the look is about the same. Todays project (after getting our monthly update sent out) was the kitchen. It’s slowly been building clutter, and the disorganization has been getting more annoying. So I tackled it. You should see my sparkling counters! Actually, I’ll take a picture for you right now. But you see that stove in the back? That’s the object of my deep-thinking tonight. Sortof. It inspired deep thoughts, anyway. It was starting to look a little grungy from all the cooking of the last few weeks. It had been wiped, but not CLEANED. There’s absolutely a difference!! So I cleaned it. But just the outside. As I wiped the oven door and opened it ever so slightly to clean that top edge, I was met by the smell of burnt food. Ew. My first thought was “GROSS I will clean that next.” But as 10 pm approached and I grew weary of listening to Brennah yell from her bed, I abandoned that idea. 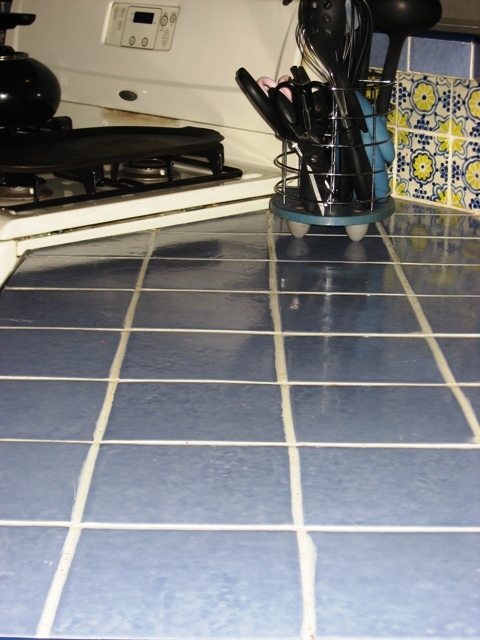 I finished scrubbing the stove-top, counters, sink, and even a few cabinet fronts. Then headed towards the sound of the baby yelling. As I sat in the dark nursing the cranky one, I thought about my oven. It looks so pretty now! Well kindof. Whatever got burned in there last made a sortof smoke stain that I haven’t been able to get off. But over all, it looks great! You’d never guess that my oven is insane. I’m totally serious. Not only is it insane, but it hates me! It has started freaking out, beeping like mad, just as it gets up to temperature. The only way to make it stop is to unplug it for about 5 min to try and reset it’s weird little brain. So not only does it stink of burnt food, it’s insane. But it looks nice! That’s when it occurred to me. I don’t want to be like my oven. Obviously, I don’t want to be insane (though I’m sure there are those who would say I’ve already arrived at that destination…) but more than that, I don’t want to stink like something burning inside me. I don’t want people to see me and say “aw what a nice Christian missionary wife,” then get a look inside and say “ew.” Because that’s what I think when *I* look inside me. I can distinctly smell something burning. Anger stinks. Bitterness has a particularly nasty scent. Hurt feelings left to fester just smell rotten. Tomorrow I will tackle the inside of the oven. Tonight I’m asking the Lord to begin cleaning out the places in me that need scrubbing.